Deck staining makes your deck look beautiful and also keeps it protected. Paint serves the same purpose but there is an essential difference between the two. When you paint wood, it obscures the grain. On the other hand, stain for wood enhances the texture and the grain of the base material. To a large extent, the beauty of your deck design depends on the material that has been used. When you use material such as wood, it goes without saying that you should also try to ensure that its natural beauty is clearly visible. Deck stain does just that. It enhances the beauty of the wood and helps it last longer. There are several different varieties that you can choose from. You can opt for one that will cover the deck in the same manner that paint does. The other variety is the semi-transparent one. This permits the grain of the wood to be visible. With some brands, you have to use a small amount to have the grain show through. Using more than the recommended amount will offer more protection but the grain will get obliterated. The deck design that you have opted for will also decide which variant will look best on it. Deck stain adds beauty to your deck but more importantly, it protects the wood. Changing weather can play havoc with wood. Leaving it unprotected will only mean that it will rot and deteriorate faster. Some brands have a water sealant incorporated into them. These are time savers as you do not have to apply the water sealant in a separate coating. Though wood stains are available in numerous colors, use one that will complement the natural color of the wood. Test a small segment of the deck and allow it to dry completely. This way you will know what the deck will look like once you have finished working on it. Deck building is an art and so is staining. It is important to be a little creative when you are undertaking this endeavor. The color of the deck is as important as the design itself. It could either match the color of your house or contrast it. In some places homeowner associations have strict rules about deck colors and you might want to check with them before you actually go about applying it on to the deck. The application can be done either in a single coat or several coats. We can advise you on what method will suit your deck the best. If there is going to be more than one application, the first coat will have to dry out completely before the next one is applied. This will provide the best effect and the best results as well. If the water sealant is going to be applied separately, ensure that the stain has dried completely. Proper maintenance is critical to the life of the deck. Experts at deck staining and fence staining including deck cleaning, fence cleaning, wood care, and wood restoration; and Professionals at deck restoration in the Raleigh, NC area. 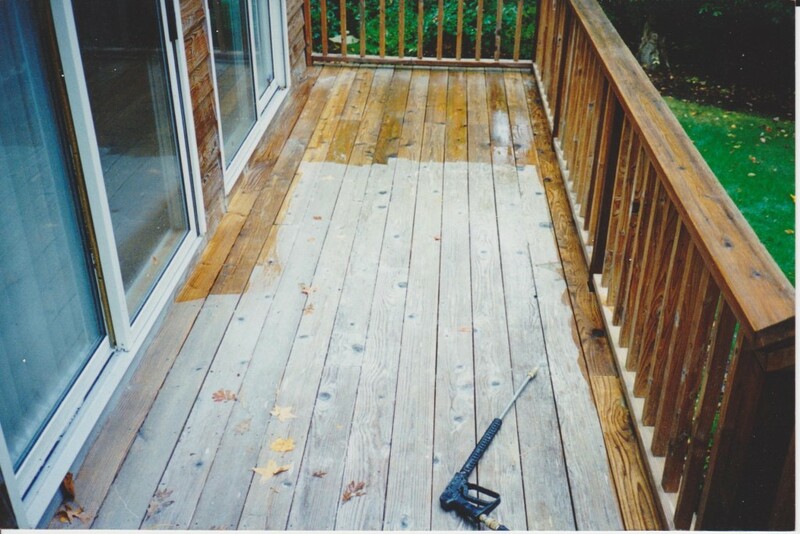 Good Faith Paint Co. is a professional Deck Staining and Pressure Washing company, Experts at deck staining, power pressure washing services, fence cleaning, and wood restoration; and Professionals at deck restoration in the Raleigh, NC area. If you’re located in Raleigh, Cary, Wake Forest, Rolesville, North Raleigh, North Hills, Knightdale, Brier Creek, Apex, call our office at (919)-368-8647 for a FREE In-Home Estimate Online.